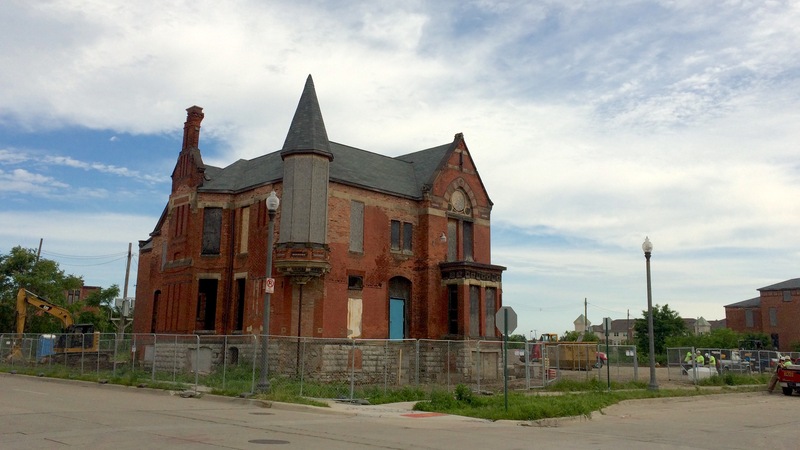 After several derelict decades, the famed Ransom Gillis house is once again making headlines. Built in 1876 by young architect George D. Mason, the Venetian Gothic brick mansion has become the fixation of pop culture as a shooting location for mega-comic crossover ‘Superman vs. Batman‘, as well as mega-remodeler Nicole Curtis of HGTV’s Rehab Addict. Numerous attempts at refurbishment have failed since the 1970’s due to the excessive cost of repairing so much weathered damage. Preservationists now are thrilled a major cable network is throwing cash at Ransom Gillis. Underneath the drive to reanimate this city is the collective memory of historic ravages. In the late sixties Detroit started burning, and it’s never stopped since. Tens of thousands of buildings have been lost to arson, sometimes dozens every day. In 1984, over 800 fires were set in just one weekend. Crews begin work on Ransom Gillis – June 2015. Click image to enlarge.